Stargazer, don´t think so. The Boeing model is a tilt-nacelle design. But you are right, lots of similarities. YES! Finally found the high resolution version! It's about time! Thank you. Way cool! Thanks for sharing. Indeed. On second look the propulsion system is decidedly very different, but general configuration shows a lot of common ideas. maybe that was a Boeing concepts for Navy Type A. It is a Boeing Navy Type A,and here is again in details. here is some Navy Type A designs,with strange concept in the first picture,right drawing. 4.PNG Figure 1 above looks like it's based on the Saberliner. There was a diagram of a really interesting Type A proposal in a link from this thread. It was an aew variant, but instead of having a radome it had sideways looking radars on the sides of the rear fuselage and radars in the nose and tail for maximum coverage. I can't seem to find it now. Can anybody point me in the right direction? Cheers! Found it! It was the McDonnell Douglas Model 276 with the side antennas. These "Type A" aircraft could be very useful for the navies with aircraft carriers that aren't large enough for fixed wing aew and asw, i.e. most of them. With the increasing number of navies with submarines and carrier based fighters an aew/asw aircraft with better performance and range than a helicopter is a definite plus. Would a S-3 Viking re-engined with Pegasus fulfil this role too? After all, the Pegasus powered Harrier is the only aircraft not to have a place in The V/Stol Wheel Of Misfortune. Some of the "Type A" contenders (for example, the Boeing Model 1041) look too complicated to work and sacrifice too much internal room and weight for myriad interconnecting cross shafts, moving ducts and too many fans and engines. Far too many things to go wrong. IMHO, the Grumman 698, the Lockheed proposal and the Bell D321 and D324 look like the surest bets, if only because their designs appear less complicated. I'd be interested in what your opinions on this subject are. Cheers! 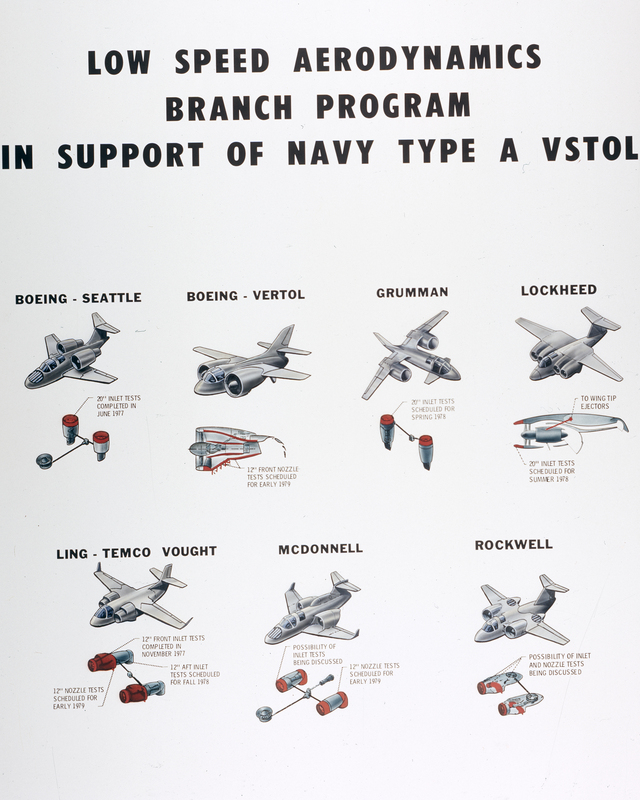 1976-77 BAe/HSA Hatfield entries for the US Navy Type A V/STOL competition. Two designs are shown, one a twin boom ducted fan design, the other with three vectored thrust engines and three lift fans. "This page devoted to our work of a decade ago for a submission to meet a US Navy requirement for a V/STOL aircraft, is published to serve as a small tribute to Charles Bradbury*. Who, in 1977 when this HSA/BAe submission being entered with other US competition for the Type A Aircraft capable of carrier borne operation, was responsible for the overall design of one of four types proposed. Known as Aircraft Configuration No 1, Charles designed this to incorporate three lift/cruise engine and three lift fans. In 1976 the US Navy confirmed the need for a V/STOL Type A, with missionised versions suitable for ASW, AEW Marine Assault, VOD, Tanker and SAR roles, in order to increase effectiveness of ship based airpower. VTOL would allow dispersal to small ships, with STO would permit increased capability from larger ships. BAe/HSA was one of six companies who submitted some eight volumes comprising the total submission in answer to US Navy requirements. One of the principal projects included in this submission was an advanced ducted fan, twin boom aircraft, for which Charles displaying his talents as an artist produced this lively impression in oils of the aircraft, for use within the promotional and presentation material."